Ciao! This is day three in Firenze. I’m here for a semester to study Italian Baking and Pastries. I’m not sure where to start with Firenze, this adventure and the first related blog entry. There’s so much I want to say. A million ideas pop within my skull (think of a popcorn machine)…but it’s just a big jumble of thoughts, nothing coherent. The likely culprit is jet lag = lack of sleep. But if you insist on knowing how the experience has been until now…the best I can conjure up is: I love it! Okay, there has to be a section that mentions all the things I’m grateful for: Thank you, Mom for watching my babies while I’m gone. Draculily (Lily or Cookie, for short) is a smart girl. 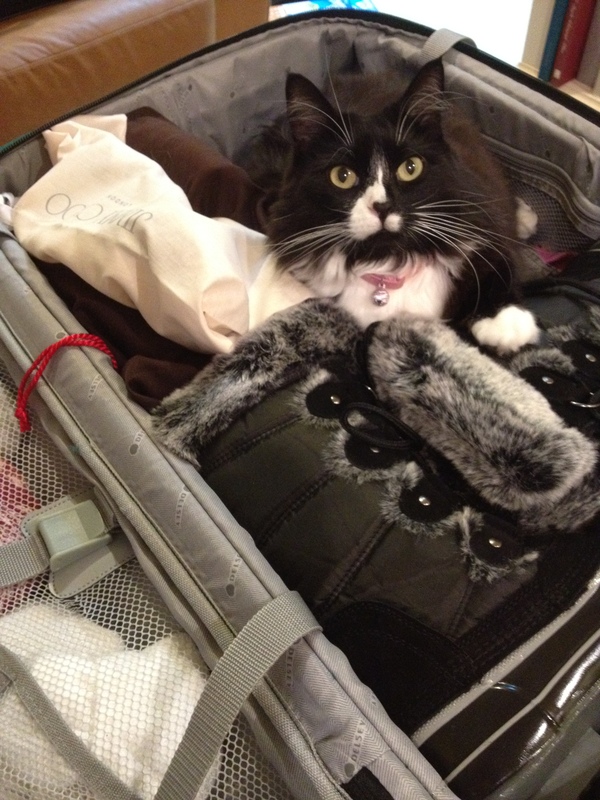 She hopped into my suitcase while I packed, perhaps hoping she could tag along. Poor baby. And thank you, Anthony, trusty vet tech, for coming over three times a day to feed them and administer medications to Mimi. Without Mom and Anthony, Italian Baking & Pastries in Firenze would never happen. I promise to bake yummy things for both of you when I return. Special thanks to weather.com and Google maps. 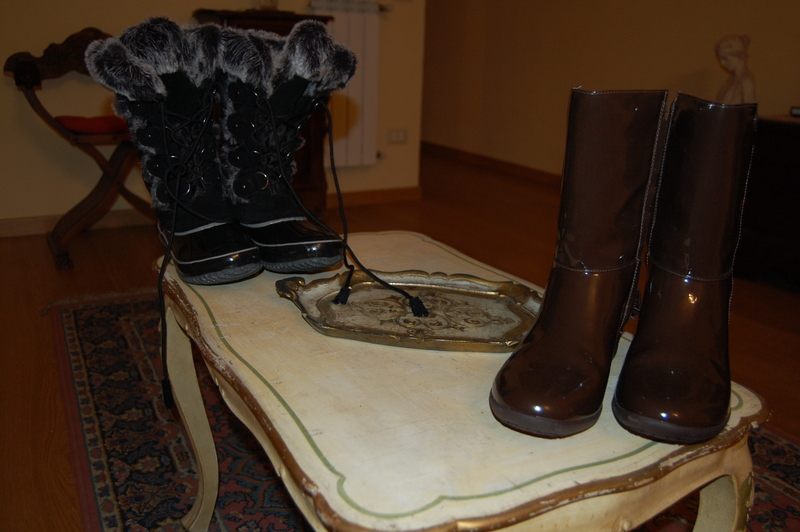 Weather.com helped me plan a wardrobe for the Italian Winter and Spring. Limit for this trip: 2 suitcases and 1 carry-on. Talk about making miracles happen. Google maps led me to orientation this afternoon. I still got lost and was 20 minutes late, but without the map and its route feature (walking directions) add an hour to that late arrival. The goal for today was to post photographs of my apartment (which is quite cute) and my school…but the iphone is out of storage space…and the rain has been pouring down every day, thus making it impossible to lug a camera around for the outdoor shots. Will you accept indoor photographs? Picture pouring rain, cold weather…and warm feet. Yes, you read correctly – warm feet. Essential items that deserve a spot on the blog…because with these I can stomp through puddles and play in the rain! P.S. We received our chef uniforms at orientation today. They’re really cute. Ciao! Hoje é dia três em Firenze. Estou aqui por um semestre para estudar panificação e pastelaria. Não sei por onde começar com Firenze, esta aventura, e o blog. Há tanta coisa que eu quero dizer. Um milhão de idéias batem dentro de minha cabeça (imagine uma pipoqueira)… mas é tudo uma marmelada de pensamentos, nada coerente. O provável culpado é o “jet lag” = falta de sono. Mas se você insiste em saber como a experiência tem sido até agora… Estou adorando! Devo incluir um agradecimento que menciona todas as pessoas que tem me ajudado chegar ate Firenze: Obrigada, mãe, por estar cuidando meus bebês enquanto estou fora. Draculily (Lily ou Cookie) é uma gata esperta. Ela pulou dentro da mala enquanto arrumava para a viagem, talvez com a esperança de que ia poder me acompanhar. Coitadinha. Agradeço tambem ao Anthony, tec veterinario fiel, por vir três vezes ao dia para alimentá-los e administrar medicamentos para Mimi. Sem a Mami soberana e o Anthony, esta viagem a Firenze nunca aconteceria. Prometo cozinhar coisas gostosas para vocês quando eu voltar. Vamos incluir o Weather.com e Google maps nos agradecimentos. Weather.com me ajudou a planejar o guarda-roupa para o inverno e primavera na Italia. O limite para esta viagem: 2 malas e 1 bagagem de mão. (Foi dificil mas os milagres acontecem). O mapa da Google me guio ate a sessao de orientação nesta tarde. Eu ainda cheguei atrasada uns 20 minutos, mas teriam sido duas horas de atraso se nao fosse pelo Google maps, que oferece o mapa pedestre. 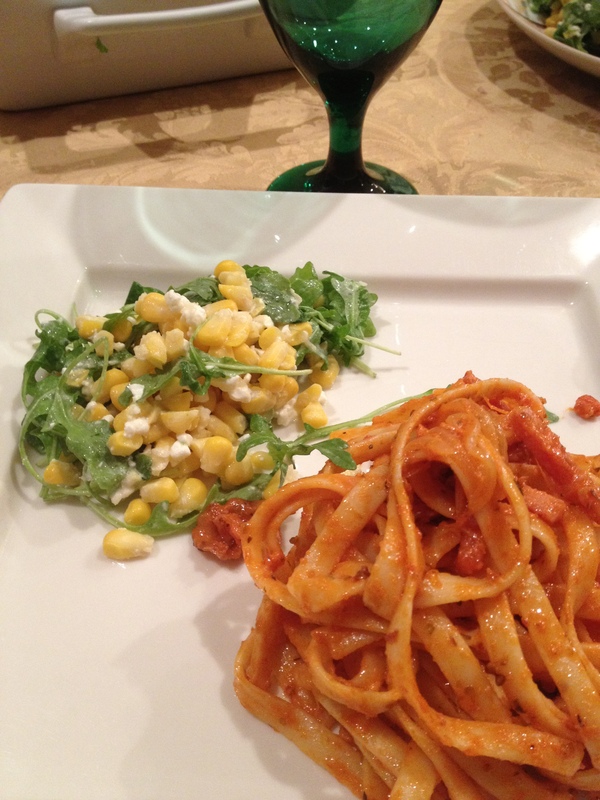 Recipe by Harry’s Bar Cookbook, Photo by Priscillakittycat. As you can tell from the picture, I used a substitute for Rigattoni. It’s okay because the important thing is the sauce. Use whatever form pasta you’d like. I can’t remember how I found out about the Harry’s Bar Cookbook. I ordered it online several years ago. It might have something to do with the fact that I love Venice and Harry’s Bar is in Venice. Harry’s Bar is famous because that’s where the Bellini cocktail was invented in 1948 and also where Carpaccio was invented in 1950. It’s fun to look through the pages of the book and fantasize about simple ingredients that come together to create unbelievable tastes. Follow this recipe step-by-step and you will see. 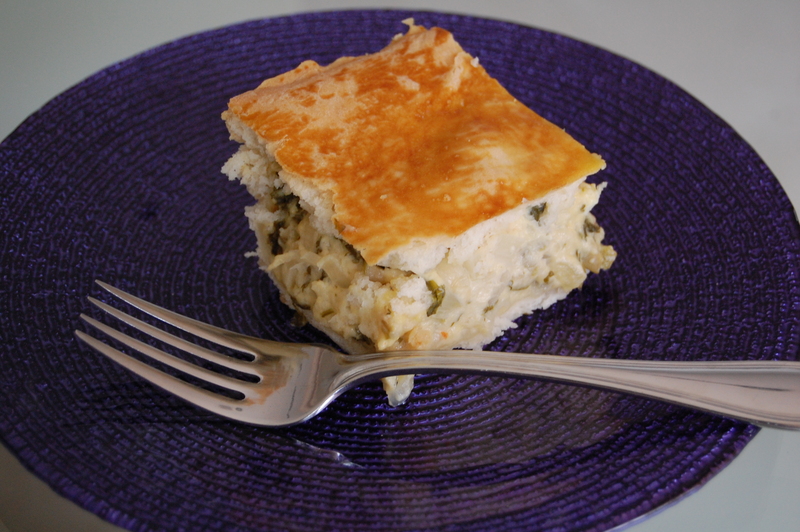 I’ve made this dish often for guests and have watched them scrape the serving dish for one last taste. When one of my family members saw the cauliflower on the counter, he said: “You’re making cauliflower?” Another one chimed in with “Cauliflower smells”. The truth is cauliflower isn’t my favorite vegetable, either. I might even feel a slight aversion to it. A Buddhist would say aversion brings suffering. Cooking is a way to overcome our aversions because we open ourselves to different sights, smells and tastes. Not to mention that my mom pulled the vegetable out of the fridge and said I should make something with it or it would go bad. Lucky for me, one day prior I received a new issue of Food & Wine Magazine. 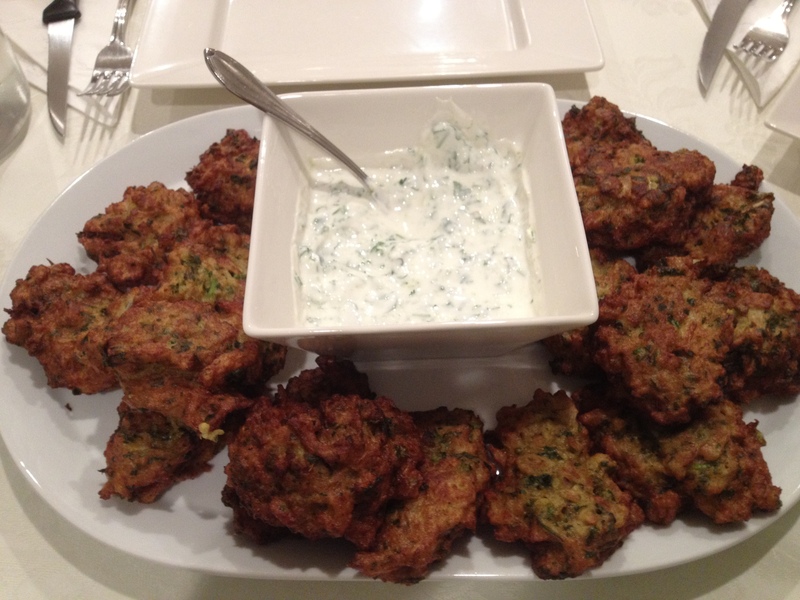 These Cauliflower Fritters were listed as the February 2014 MOST WANTED RECIPE. Trust me on this one! We’ve let go of our aversions. It’s now on our family’s list of MOST WANTED RECIPES. 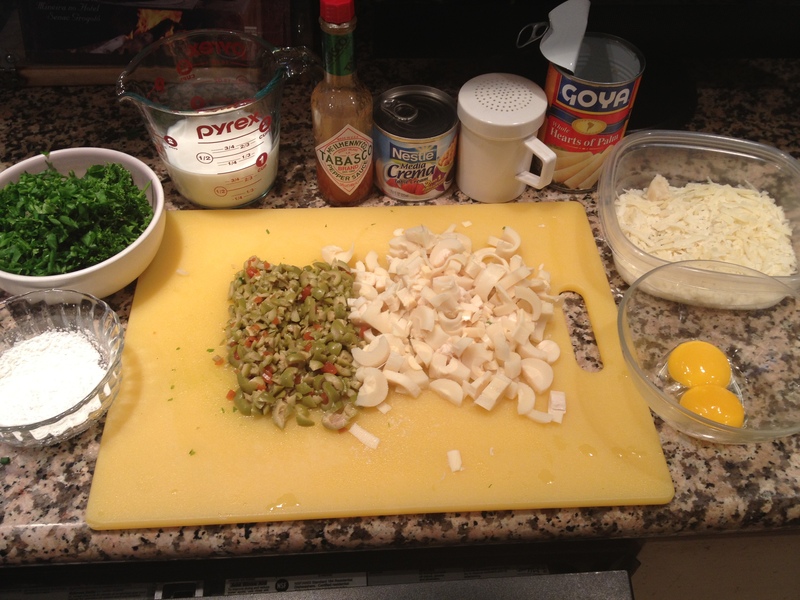 MAKE THE LIME SAUCE Put all of the ingredients in a bowl and whisk well. Taste—the flavor should be vibrant, tart and citrusy—and adjust the seasoning as necessary. 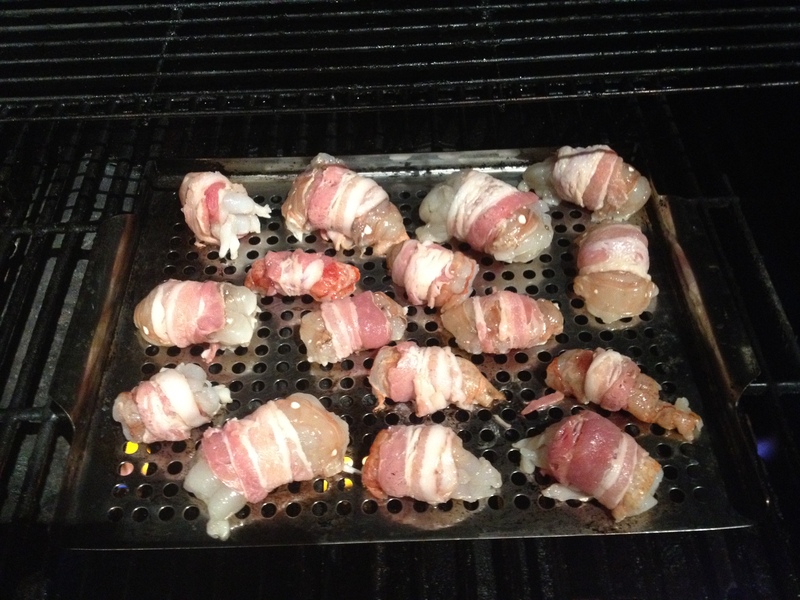 Chill or leave at room temperature for up to 1 hour. PREPARE THE FRITTERS Add the florets to a saucepan of salted boiling water. Simmer until very soft, 15 minutes; drain. Meanwhile, put the flour, chopped parsley, shallots, garlic, eggs, cumin, cinnamon, turmeric, salt and pepper in a bowl and whisk to make a smooth batter. Add the warm cauliflower. Mix, smashing the cauliflower into the batter with the back of a wooden spoon. In a wide skillet, heat 2/3 inch of oil over high heat until very hot. Working in batches, spoon in the cauliflower mixture, allowing 3 tablespoons per fritter. Separate the fritters with a fish spatula. Fry in small batches, adjusting the heat so the fritters cook but don’t burn. They should take 3 to 4 minutes on each side. 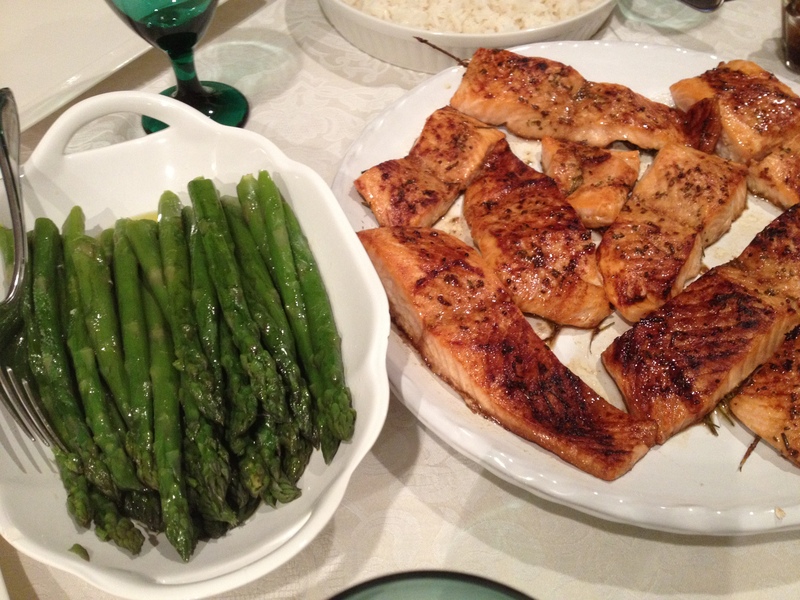 This a a re-blog because the Salmon recipe (taken from Everyday with Rachel Ray) is worth it. You can view the same recipe that I previously posted under the October 2013 link. This time I adapted the recipe by adding a little more brown sugar and rosemary than the amounts specified. I also covered the baking sheets with aluminum foil to keep the baking sheets clean…and used the broil setting (500 F) for just a few minutes before removing the salmon from the oven. Doing this makes the salmon slightly crispy on top. Position a rack in the center of the oven; preheat to 425 degrees . In a medium bowl, stir together the two vinegars, brown sugar, worcestershire, soy sauce, mustard and chopped rosemary; season with salt and pepper. Whisk in 9 tbsp. EVOO. 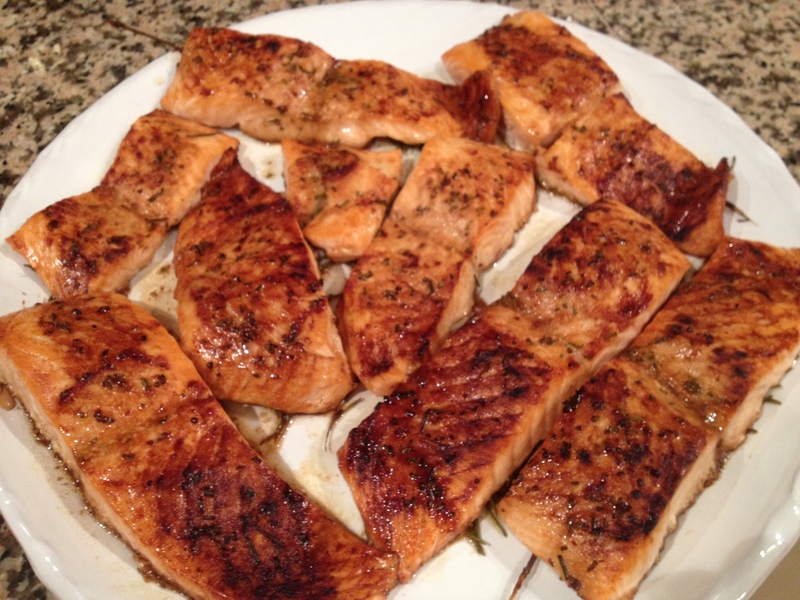 Lay the salmon fillets skin side down on a greased baking sheet. Tuck a rosemary sprig under each. Brush the fillets with EVOO; season with salt and pepper. Whisk the sauce and spoon some over the fillets. Roast until firm and just cooked through, about 10 minutes. Postei esta mesma receita em outubro de 2013 e estou re-postando porque vale a pena. Desta vez eu acrescentei mais açucar mascavo e alecrim do que a receita pede. Tambem cubri a forma com papel aluminio e aumentar a temperatura do forno para 500 F para deixar o salmon ficar um pouco crocante. Posicione a prateleira do forno no meio e aqueça o forno 220 graus (425 F). Numa tigela misture os dois vinagres, o açucar mascavo, molho ingles, shoyu, mostarda e o alecrim picado. Tempere com sal e pimenta. Acrescente o azeite e bata com um batedor. Forre uma forma rasa com papel aluminio e unte a forma com azeite. Ponha os filets do salmon na forma com o lado da pele virada para baixo e coloque uma espiga de alecrim debaixo de cada filet. Pincele azeite extra virgen sobre os filets e depois de misturar o molho com o batedor, coloque colheradas do molho sobre o salmon. Leve ao forno pre-aquecido ate ficar cozido. Aumente o forno para 260 graus (500 F) e cozinhe o salmon ate ele ficar corado e um pouco crocante. Rasta Bunny is my Giant Flemish breed rabbit. He’s a big boy and needs lots of room to roam, hop and rest. All rabbits need room to stretch and hop or their legs will atrophy and become stiff. Without exercise they’re also more susceptible to disease and obesity. This translates to shorter life spans. My neighbor and his wife found Rasta Bunny hopping around our neighborhood in 2009. He’s been with me ever since, roams loose (no cage) and is litter box trained. 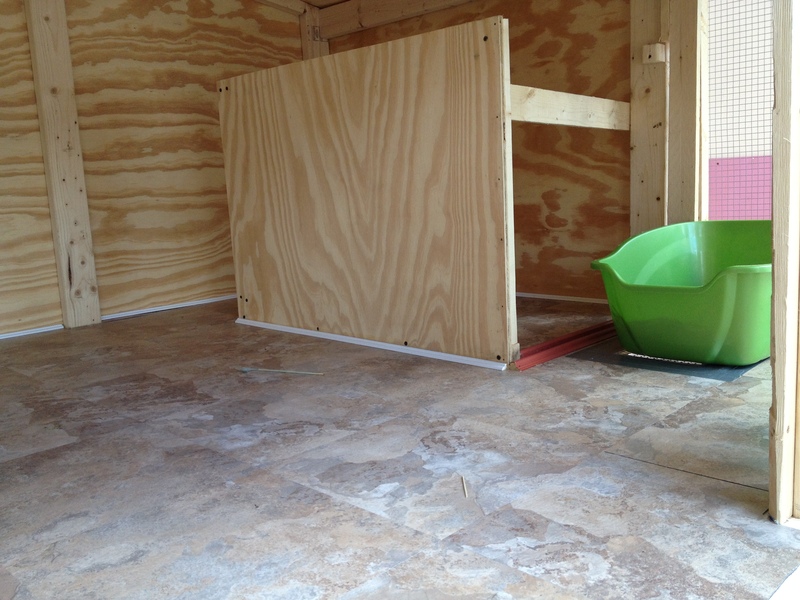 It’s surprisingly easy to train a rabbit to use a litter box. Just buy a cat litter box, fill it with litter that’s appropriate for gerbils (no cat litter). Put some Timothy Hay at the front of the litter box. Put your bunny inside…and let him eat while he litters. Kind of like what humans do when they take magazines into the bathroom. You can also place some of your rabbit’s poop in the litter box so he knows that’s where it belongs. It took me less than two days to train Rasta Bunny. Male rabbits should also be neutered because they tend to spray urine to mark their territory. 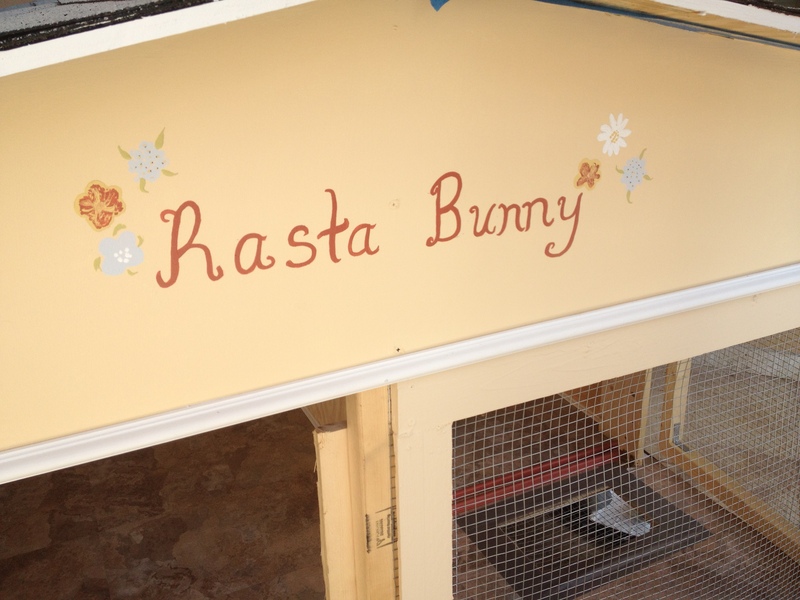 Before Rasta Bunny was neutered, he’d sometimes hop past me and spray the bottom of my pants. Was he trying to say I was his territory? Who knows, but soon after the first spray, I took Rasta Bunny to the vet to get his manhood taken away…and he stopped spraying! Rabbits are sensitive animals and need lots of care and attention. If you plan to purchase a rabbit, please think about the work involved as well as the money you’ll need to spend if your rabbit becomes ill. Most ordinary vets do not see rabbits. You’ll have to find an Exotics vet…Dr. Barbara Tomaras is the best exotics vet ever. She loves rabbits. Avian & Exotics on South Dixie Highway, near Sunset Place is where she works. She always works out of another animal hospital in Ft. Lauderdale. Just Google her and you’ll find contact information. 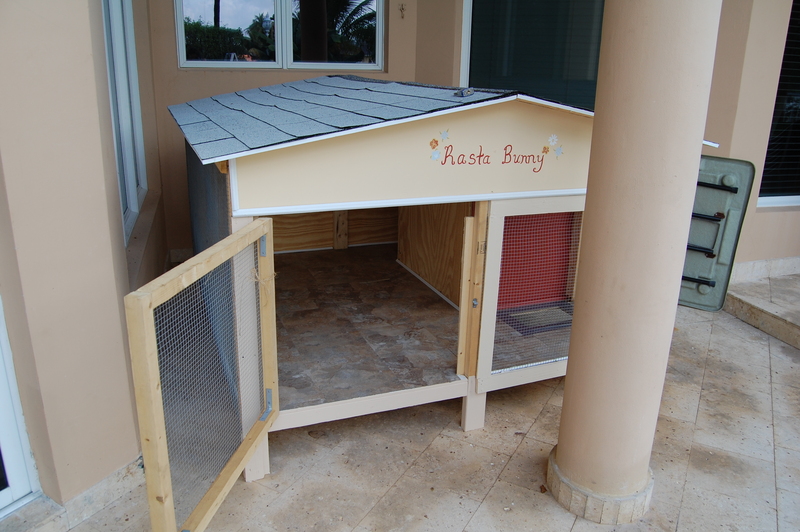 Okay, to make a long story short, I wanted to have an outdoor enclosure for Rasta Bunny…but couldn’t find one large enough. 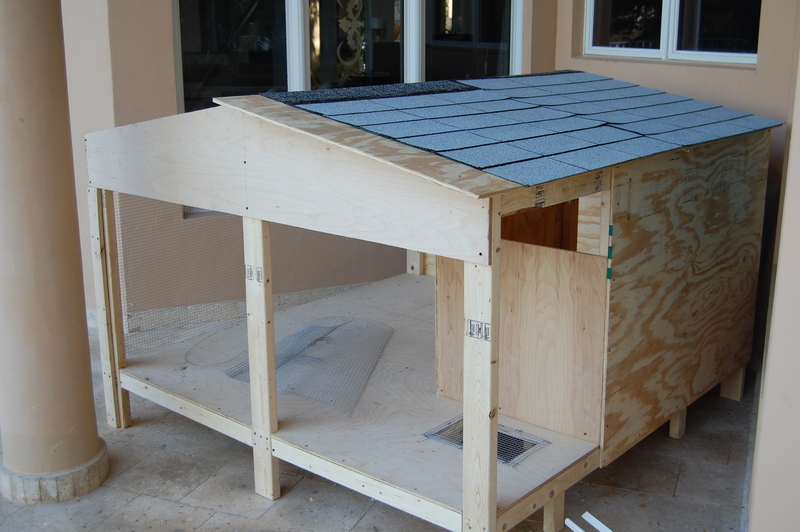 And most of the rabbit home builders I found online are in Europe and don’t export their products to the US. Joao to the rescue! Joao is a Brazilian landscaper who also happens to build things to order. He was referred by a friend. He met me at our home. 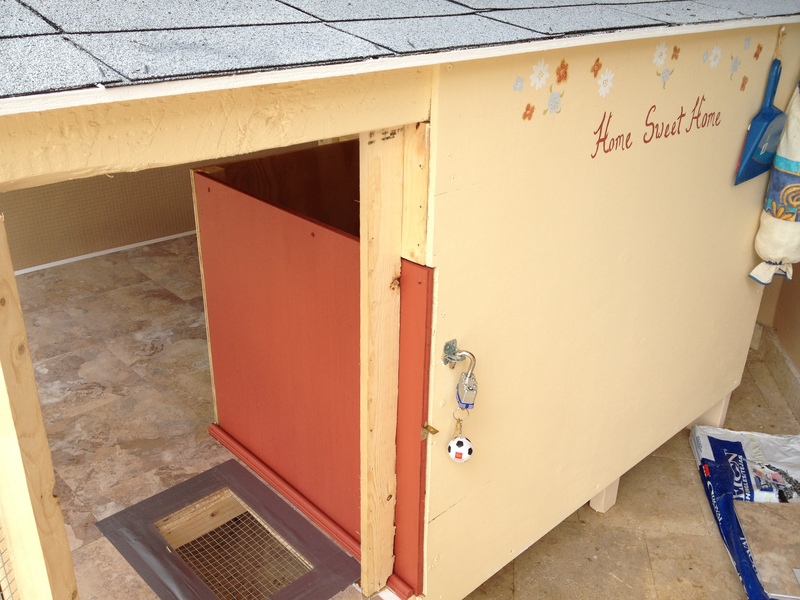 I told him exactly what I wanted for the rabbit enclosure, including two doors with locks, a hiding place for Rasta to be protected from the wind or hot sun, and a place for a litter box. I went with Joao to Home Depot and purchased the supplies. He charges for labor, per day. 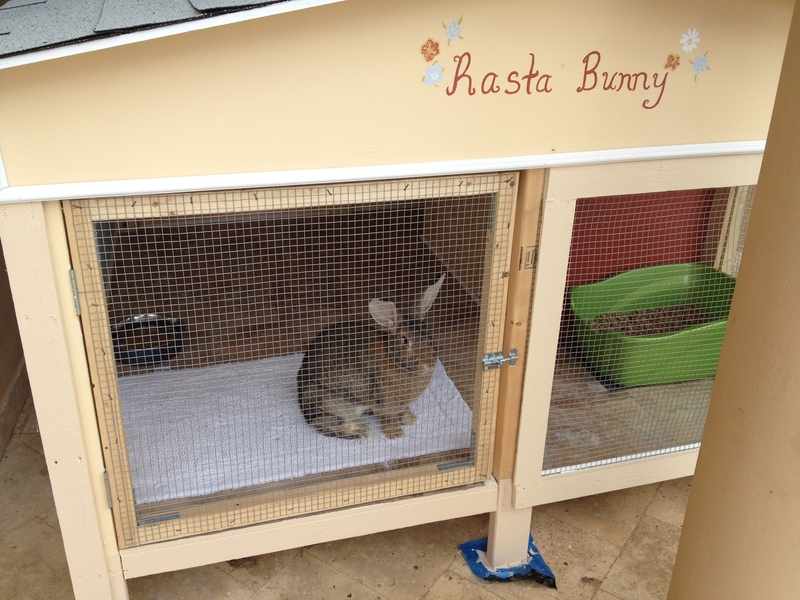 It took him 3 days to build Rasta Bunny’s home. After Joao was done with the structure, I painted the home and added the some extras, including vinyl self-adhesive floors, crown molding, and hooks for hanging supplies. Please make the world a better place for living beings…take good care of your pets. And if you need Joao’s contact information, feel free to write to me. 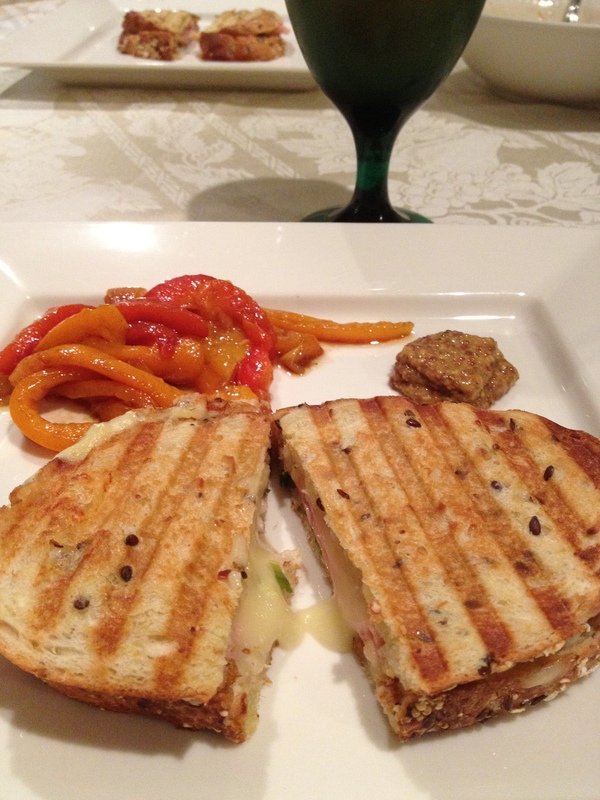 When you have some Robiola Bosina cheese and Mortadella lying around, try this quick recipe. I found Robiola Bosina at the Cheese Course in Weston…but any other mild cheese would work. As a matter of fact, good quality mozzarella would have been fine. The Dijon mustard is important for taste. I used it in the sandwich as well as on the side for dipping. 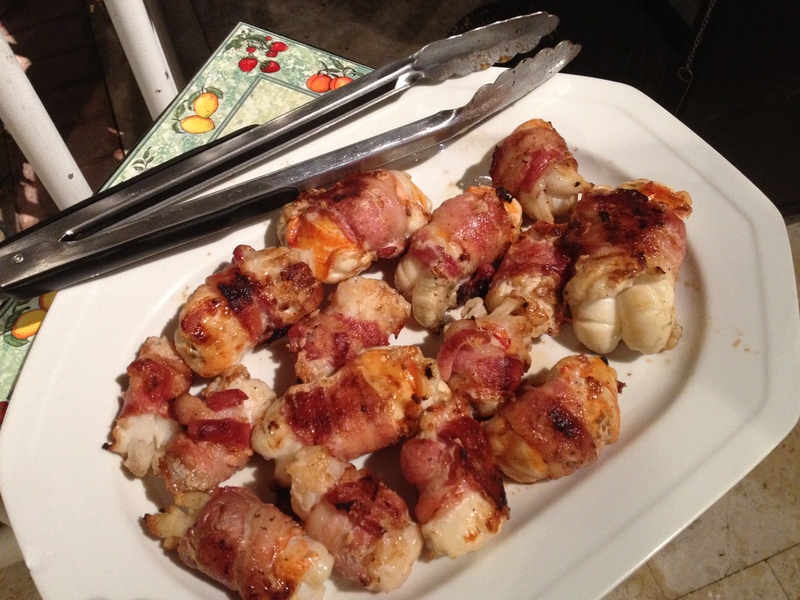 Just cut the lobster into pieces, wrap each piece with bacon and grill. That’s it! Apenas corte a lagosta em pedaços, enrole com bacon e leve para a grelha. Maravilha! Okay, so I found this exquisite recipe in a cookbook, from the collection, “Araxa Poe a Mesa”. I received these cookbooks from our Brazilian friend, “Rosinha” at least 15 years ago. There are three books in the series and each is a compilation of recipes contributed by housewives from the State of Minas Gerais, in Brazil. That’s where my family is from. In my opinion, the food from “Minas” (short for Minas Gerais) is the best in Brazil. I’m not saying this because we’re “Mineiros”, as people of the region are called, but because when I prepare foods from Minas, the compliments keep coming. Melt the butter in a medium skillet. Add the onions and cook until golden. Add the hearts of palm and saute. Add the green onions and parsley. Meanwhile in a food processor or blender pulse the milk, egg yolks, and cornstarch. Combine with the hearts of palm mixture until thickened. Add the Parmesan, chopped hard boiled egg, olives and table cream. Remove from heat and cool. In a large bowl combine the dry ingredients for the dough. Add the butter and milk and stir. When dough begins to form, knead dough with hands, adding more flour as necessary. 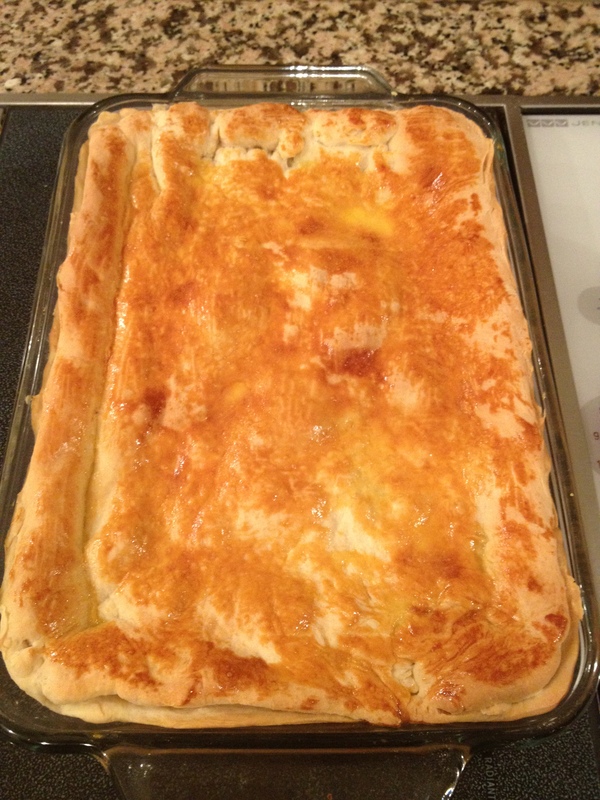 Use a rolling pin to open the half the dough and cover the bottom and sides of a pyrex or baking pan with the dough. 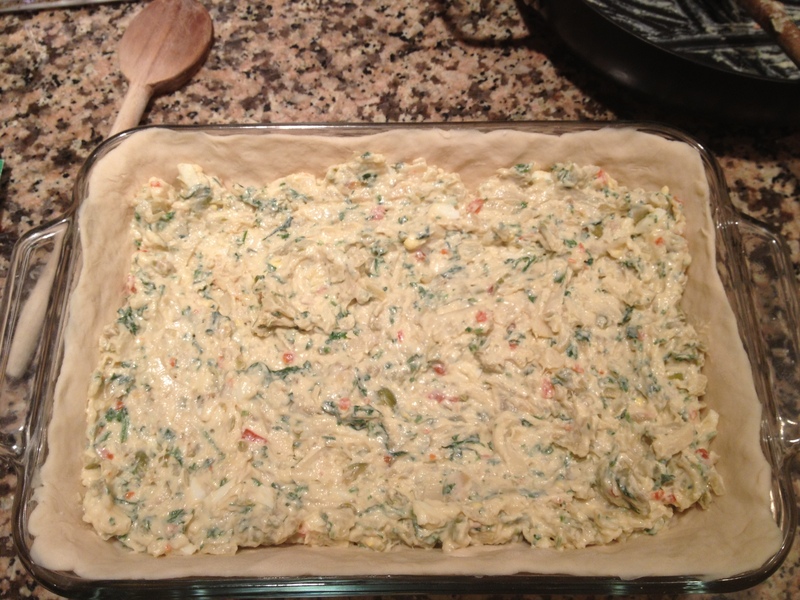 Add the Hearts of Palm filling and cover with the other half of the dough. Brush egg yolk over the top and bake at 350 degrees for 35-45 minutes. Serve cold or hot. Entao, encontrei esta receita no livro de receitas, “Araxa Poe a Mesa” e logo me lembrei da amiga (Rosinha) que me presenteou a coleçao de tres livros a mais de 15 anos. Estes livros despertaram o meu interesse na culinaria e os utilizo até hoje. Esta receita é super facil de seguir e o resultado é uma torta deliciosa. Muitos elogios virao! Refogue a cebola na manteiga ate ficar dourada, acrescente o palmito e deixe fritar. Bater no liquificador, o leite, as gemas, a maizena, junte ao palmito e deixe engrossar. Acrescente of queijo, o ovo cozido, azeitonas e o creme de leite. Com a metade da massa, forre a forma. Coloque o recheio frio, e cubra com a outra metade da massa. Pincele com a gema, e leve a assar. Pode servi-la quente ou fria. Cortada em pequenos pedacos pode ser servida em lanches.